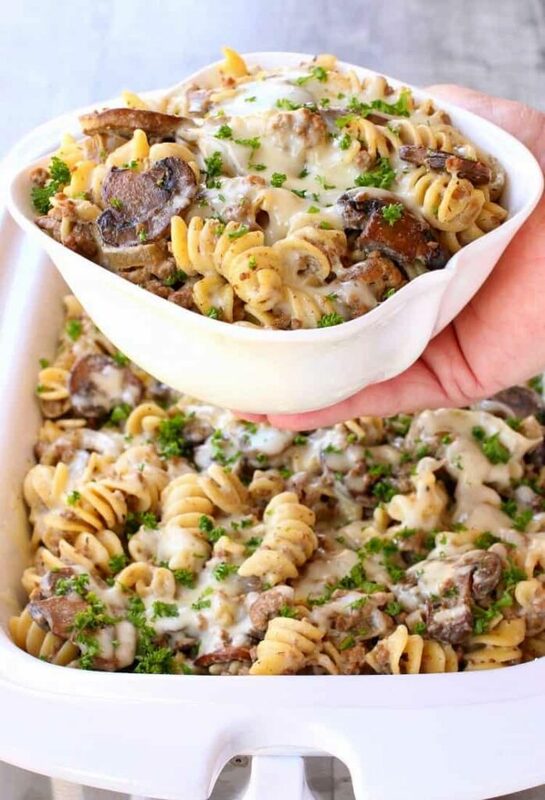 Slow Cooker Cheesy Beef Stroganoff is loaded with beef, mushrooms and of course cheese to make a delicious dinner the whole family will love! Slow cooker dinners are on everyone’s mind these days. 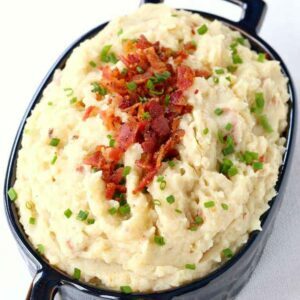 The cold weather makes us want comfort food – sometimes a little too much comfort food – but that’s just what seems to happen. And we make sure we’ve got lots of other supplies on hand too but dinner is the first topic of conversation. 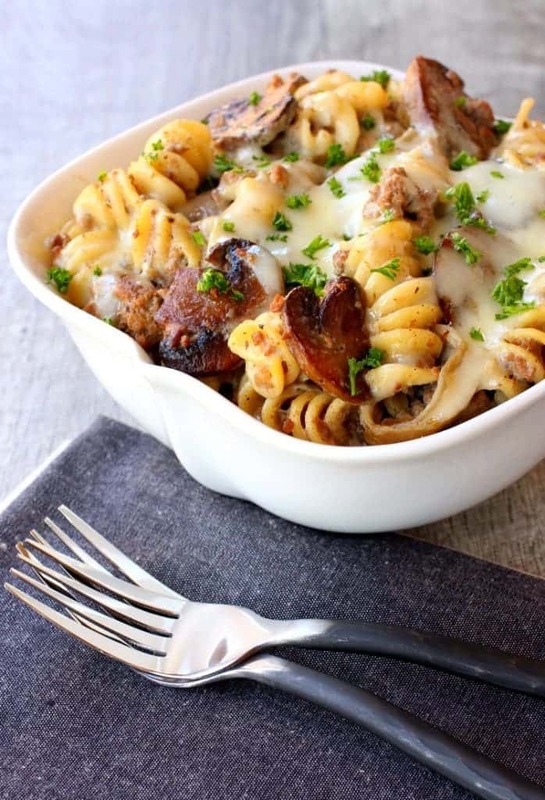 Pasta is comfort food for us, and anything with cheese…well that’s a given. And there’s something about being trapped in the house and smelling the slow cooker working away all day that makes you feel like you never want to leave the house anyway. We even have a generator in case the power goes out – which is does a LOT in my neighborhood so we are definitely prepared. 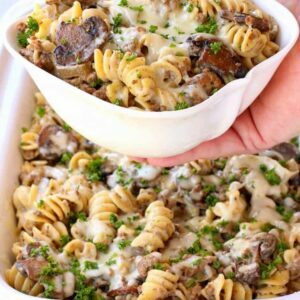 This Slow Cooker Cheesy Beef Stroganoff isn’t a dump everything in the crock pot kind of recipe, there’s a couple of steps but they’re totally worth it. 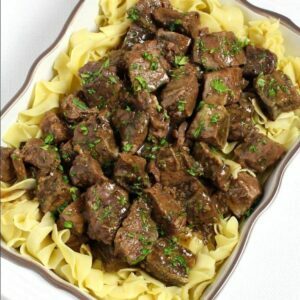 Beef Stroganoff is one of my favorite dinners, hands down. In all forms, soup, casseroles, skillet dinners, any way I can get it. 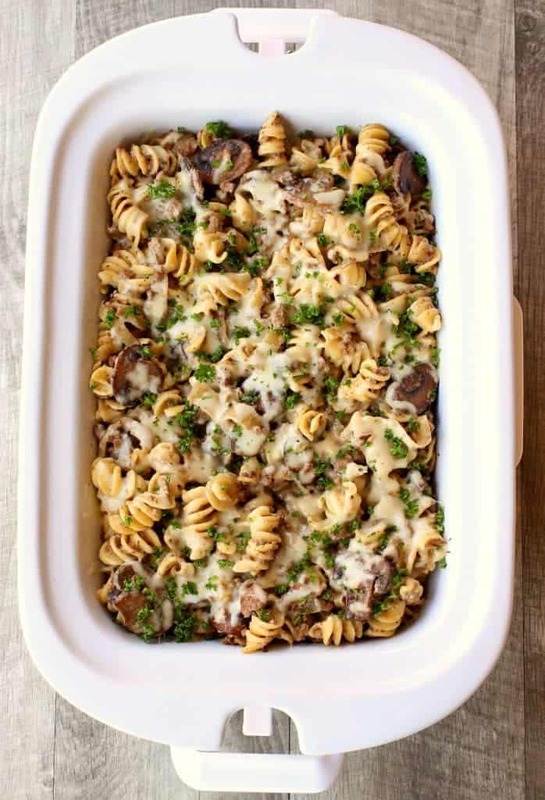 Browning the beef and mushrooms before adding them to the slow cooker makes this dinner has so much more flavor, it’s definitely worth the extra 15 minutes! 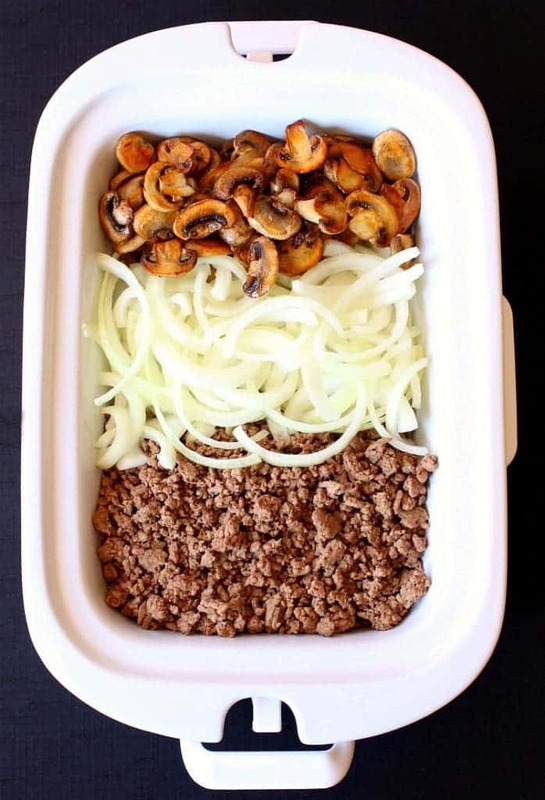 So after you brown up the beef and mushrooms, now you can dump everything else in…the onions, seasonings an beef broth. Let that cook on low for 4 hours, then add in cream cheese for another hour…stir it up…ad cooked pasta and another layer of cheese. This time it’s a layer of mozzarella on top, cover, let the cheese melt and serve. I’m telling you, it doesn’t get much better than this – all the flavors of beef stroganoff topped with a big layer of mozzarella. No one is going to care about the snow outside when you’re eating this dinner! In a large skillet, brown the mushrooms with the olive oil for 10 minutes until browned. Add the other tablespoon of oil and brown the beef until cooked through, then add to the slow cooker with the mushrooms. Season the beef and mushrooms with the salt, pepper, garlic powder and oregano. Place the sliced onions on top of the beef and mushrooms then pour on the beef broth. 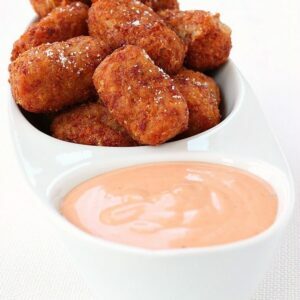 Remove the lid and add cream cheese..
Cover and cook one hour on low. Remove the lid, add the marsala wine if using and stir to mix in the the cream cheese. Stir in the cooked pasta then add a layer of mozzarella cheese to the the top, cover and cook for another 30 minutes until the cheese has melted. I cooked a whole box of pasta, then just saved the leftovers.